Wondering how to eat kimchi without just using it as a side dish? 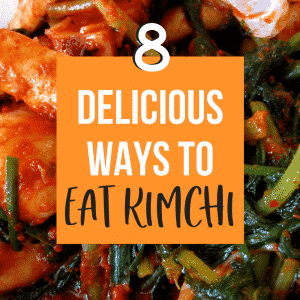 There are lots of delicious ways to eat kimchi – keep reading to find out what they are! If you haven’t heard of Kimchi yet, you will soon. This fermented side dish is a staple in the Korean diet and it’s popularity has been booming recently all over the world. Kimchi is packed with gut-healthy bacteria, rich in vitamins A & C and bursting with antioxidants. This flavor bomb will quickly become a delicious addition to your diet. Kimchi is commonly eaten as a side dish, but if you’re wondering how to eat kimchi without just serving it on the side of your plate, then keep reading. 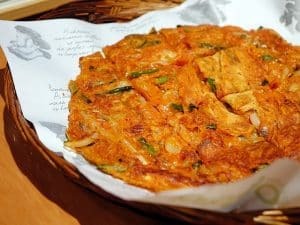 I’ve rounded up some delicious ways to eat kimchi that make this Korean staple the star of the show. Want to take your fried rice game to the next level? 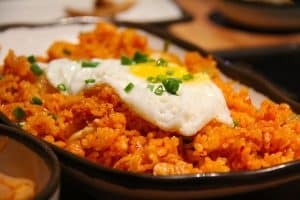 Make kimchi fried rice instead. Elevate the flavor of your grilled cheese sandwich by adding some finely chopped kimchi. The combination of of kimchi and cheese produces a whole new level of flavor and texture. Be careful though, you might just become addicted to this flavor combination. This recipe from David Chang of Momofuku takes the basic deviled egg and upgrades it about 100 notches. If you’re a fan of adding sriracha to your eggs, then you’ll love the addition of kimchi to your omelet. Some other great additions include scallions, shiitake or cremini mushrooms, spinach and cheese. You can prepare these any way you’d like – deep fried, steamed, pan fried, baked… And you don’t even need a dipping sauce because these dumplings are bursting with flavor on their own. Forget pepperoni, kimchi pizza is where it’s at. Grab a pizza base from the store (or better yet, make your own!) top it with some pizza sauce, chili kimchi, and cheese, and pop it in the oven. Take your regular Buddha Bowl to the next level with the addition of some chopped kimchi. Kimchi quesadillas make the perfect quick, easy, healthy dinner. Simply add some cheese, kimchi and parsley, then pan fry. Dinner ready in 5 minutes!